Did you know there is one sure-fire, really easy, totally free way to grow your book of business? Yet, for many attorneys, the referrals are not coming on a regular basis. Why? You do not have systems in place to ask for and receive referrals. Here is the issue: You do an amazing job for your client. I don’t care what the practice area is, I don’t care what the legal issue is – once that client is done with you, you are now out of sight and out of mind. They are not sitting around thinking: “Gosh, what an amazing lawyer – how can I refer business to him/her.” They are sitting around thinking: “Thank goodness that’s over with!” And you become a distant memory. And maybe, just maybe, your name comes to mind if one of their friends or colleagues has a similar issue. Then, you may get a referral. But if you could systematize referrals, wouldn’t that grow your practice? It is time to stop treating all of the people you know as a commodity and start personalizing your contacts with them. There are many different systems you can use. One of the plethora of ways you can do this is to create newsletters. Again – plural. You should have different newsletters for different groups of referral sources. For example: if one of your sources of referrals is accountants, than write specifically for accountants. If another source of your referrals is former clients, then write specifically for them. At the end of each newsletter, you can ask them for referrals by NOT asking them for referrals. Instead, ask them to forward this information to someone like them who may be interested. 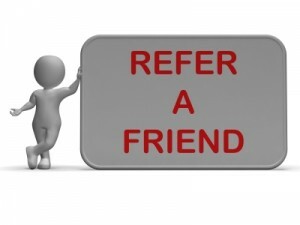 This is just one idea of many that you can employ to begin creating referrals. Over the course of the next few Rainmaking Recommendations, I will be discussing referrals, referral systems and the best way to get more! I will also be writing about the ethics of referrals so that you don’t do anything that may cause you to violate the rules. (You can sign up to receive Rainmaking Recommendations directly to your in-box by sending an email to info@marketingfield.com and requesting to be on the list). LEARN TO BECOME A RAINMAKER AND GET YOUR ETHICS CREDITS! NOW PROVIDING CLE’S IN NY, NJ AND PA. IF YOU ARE IN A NEW YORK, NEW JERSEY or PENNSYLVANIA LAW FIRM AND HAVE 10 OR MORE ATTORNEYS, SCHEDULE AN ON-SITE RAINMAKING TRAINING SEMINAR IN 10 DIFFERENT TOPICS – EACH WITH ETHICS CLEs. CONTACT ME FOR DETAILS (More states being added each month). Want to bring group Rainmaking coaching to your firm? Try Individual Rainmaking Coaching? Call or email for more information.